Tag line: "The classic story of power and the press"
Trivia: It was RKO head George Schaefer who suggested the title change from American to Citizen Kane. Orson Welles had also wanted to call the film John Q. 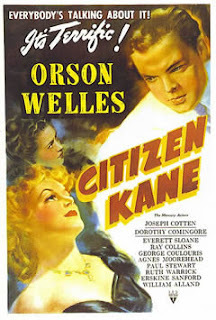 Considered one of the finest motion pictures ever made, Citizen Kane has been the subject of hundreds of books, articles, essays, reviews, and even the odd term paper. With so many pages already dedicated to this great film, what more is there to say about it? Well, there’s my take on it, I guess. Charles Foster Kane (Orson Welles), the millionaire newspaper magnate, is dead. Before passing on, however, he whispers one final word: “Rosebud”. To solve the mystery of his last utterance, a reporter visits the people who knew Kane best, including Kane’s oldest friends, Jedediah Leland (Joseph Cotton) and Mr. Bernstein (Everett Sloane), and his second wife, Susan Alexander (Dorothy Comingore). Through them, this reporter puts together the pieces of a life riddled with chaos and overindulgence, lived by a man who had the world at his fingertips, yet always desired more. I align myself with the majority in declaring Citizen Kane a true American classic, but what is it about this extraordinary movie that appeals to me? Perhaps it's the groundbreaking camerawork of Gregg Toland, whose contributions were considered invaluable by Welles himself? Or maybe it's the film's stunning use of deep focus, an innovation at the time that has since become commonplace? Either of these would be reason enough to proclaim it a masterpiece, yet in the end I decided that, for me, the strongest element of Citizen Kane was Kane himself. With passion and a touch of audacity, Orson Welles transforms Charles Foster Kane from a brash young newspaperman waging a war against corruption into an aged, battle-weary shell of a man, secluded in a fortress of excess and done in by a strong belief in his own mythology. I get chills when I recall the scene where Kane is chasing after Jim Gettys (Ray Collins), his opponent in the campaign for Governor, who has threatened to reveal Kane’s extra-marital affair with Susan Alexander if he doesn’t immediately drop out of the race. Refusing to buckle under, Kane lashes out with defiance and anger. “I’m Charles Foster Kane!” he screams at Gettys. “I’ll see you in Sing-Sing, Gettys! Sing Sing!” Everyone around him, including his estranged wife Emily (Ruth Warrick) and even Susan Alexander, believe it would be best for Kane to gracefully withdraw, but his descent into megalomania has already begun, and he will not permit anyone, or anything, to stand in his way. Though occasionally flashy and over-the-top, Welles' performance remains a highlight of the film. For the dramatic thrust of Citizen Kane to have been effective, It was essential that Kane come across as larger than life. In Orson Welles’ capable hands, Charles Foster Kane was larger than many lives put together. When I wrote a review of this (I've reviewed all of Welles' films), I was similarly baffled about what to say that hadn't already been said. A great film? Obviously. (See it on the DVD which has Roger Ebert's commentary, BTW -- it's very interesting.) Innovative? Yes, but (as Welles himself always admitted) a lot of what he did came from Ford. Welles screened Stagecoach every night for a month to prepare for Kane, and you can see what he learned (Ebert talks about this on his commentary). I would say it's one of the greats, endlessly re-watchable (there's always more to see), endlessly quoted by other directors (here's a drinking game: watch Oliver Stone's Nixon and have a drink every time he quotes from Kane -- you won't make it to the end of the film). One of Welles' three best performances, IMHO (along with Chimes at Midnight and The Third Man). My favorite film he directed remains Touch of Evil, though. Anthony: I've actually seen the movie with Ebert's commentary, and I agree with you...it's very interesting. I also recall a quote attributed to Welles when discussing the 3 great masters of film, and while I can't remember it exactly, he said something like "and by three masters, I'm of course referring to John Ford, John Ford and John Ford". It is definitely rewatchable, and I'll have to try that drinking game you suggest!). And while I personally would list KANE above TOUCH OF EVIL, it is VERY close, and I certainly can't fault you for preferring that movie. It is a great one! I'll never forget the first time I saw CITIZEN KANE. I couldn't have been older than ten or eleven years old...and I was mesmerized by the film. I'd never seen anything like it, although the movie was close to three decades old by then. It may have influenced many a director and cinematographer, but damned if anyone of them tried to recreate its scope and depth. Much the same as James Robert Smith above commented I to saw "Citizen Kane" at about age 11 or 12 on my local PBS. I was in total awe mesmerised and transfixed into the world & cinematic vision of #OrsonWelles! Seen through the eyes of Charles Foster Kane left a lasting impression upon me!That was the day I learned the power of epic filmmaking I fell in love with film! A lifelong love affair this film & "Pulp Fiction" are my 2 favorite all-timers!